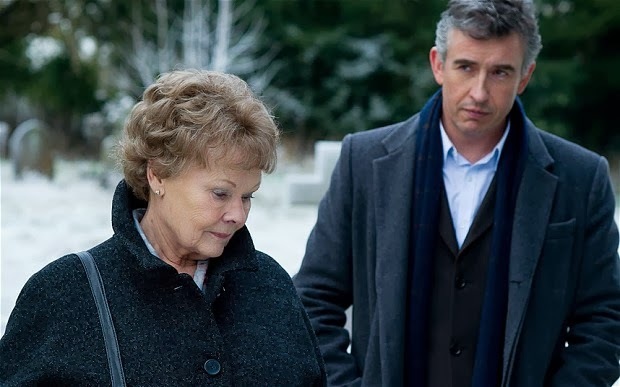 Philomena has been one of 2013's most praised films, for good reason. It tells the true story of Philomena Lee, who got pregnant as an unwed young woman in 1950s Ireland. Her family rejected her, and her father left her at one of the infamous Magdalene laundries—convents that housed unwed young mothers, kept them in indentured servitude, and sold their children to adoptive couples. Philomena eventually left, married, and had two daughters, but kept her first, lost child a secret for 50 years. When she eventually told her daughter about her lost first-born, her daughter arranged for her to meet with a struggling reporter to investigate what happened to her son. The movie, in terms of its filmic qualities, was hit and miss for me. In Judi Dench's portrayal, Philomena's personality is a bit indistinct, and I couldn't reconcile her horrific experiences, her doggedness in pursuing her son, and her meekness and occasional uncertainty. The storytelling left some issues hanging, like Philomena's reaction to the little girl who was adopted by the same parents who adopted her own son. Philomena had known this little girl as a baby and toddler; her mother had been her best friend. And yet Philomena doesn't react emotionally toward her, doesn't talk about how she and her son had been friends as children, doesn't reminisce about the girl's mother. It felt strange, just . . . off. This story, however, is incredibly compelling. No matter that the filmmaking isn't perfect. At times you could hear sniffles throughout the entire theater as people suppressed their crying. It was just heartbreaking. And I can't shake it. I'm home, still wondering if any of the perpetrators of these whitewashed gulags were ever prosecuted or held accountable. And for anyone who has lost a child, the film beautifully portrays the enduring pain of that loss, which never goes away and can only be turned aside from in order to get on with life. Lynn, that's a great point about the marketing of the film. I hadn't thought of that. 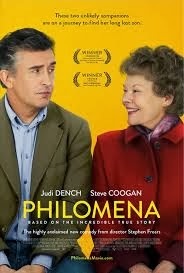 Regarding Philomena's indistinct personality, I saw her as a very complex character with mixed emotions: her sorrow, guilt, religiosity, sense of Catholic duty, great sense of humor, charmingly blunt honesty, and straightforward approach to enjoying a simple life all swirled within her and made decision-making a difficult and painstaking process, so she appeared wishy-washy. The reporter was not as complex; his skepticism of religion and his moral outrage over what had happened overrode every other consideration, so it took him the whole movie to begin to appreciate Philomena's complexity and be sensitive to her often conflicting needs. Regarding her meeting with her son's stepsister, that threw me too --- in fact, at first I didn't realize that was the same girl. Thinking about it later, though, it makes sense to me that Philomena didn't try to reach out to this woman who, frankly, wasn't making her feel welcome, didn't seem the least bit curious, and was too overwhelmed with her own grownup problems in the present day to care about digging up the past. Overall, I thought it was the best movie I'd seen all year --- very emotional, as you said. --- Bob C.
Glad you found her to be believable. There's a fine line between inconsistency and complexity, and sometimes it's just a matter of how a character feels to each viewer. I found the reporter to be very natural; I think his reaction was more realistic, even if it wasn't as complex. I mean, how complex does one's reaction have to be to a crime of this magnitude? I think she probably tried very hard to empathize with the church elders somehow so she wouldn't have to carry around a lot of anger and hatred for all those years, which would be exhausting. Also, she probably needed her religion to cope with the sadness, and she feared that to reject the church outright would make the religion inaccessible to her. People often have strange coping mechanisms for dealing with emotional trauma --- e.g., the Stockholm syndrome. Absolutely. I agree with your ideas about her coping mechanisms. But since the reporter didn't experience it first-hand and have to come up with those mechanisms, his reaction felt normal to me. I agree. Even though I didn't find him to be as complex as Philomena, I still found him to be normal/natural/believable.